Event planning, by and large, means being in the people business. That doesn’t mean that introverts can’t do it, but an extrovert might have an easier time of things in the event and wedding planning business. Employers will look for candidates who have a high tolerance for stress, remain calm under pressure, have versatile and sophisticated communication styles, and are comfortable being at the center of creative planning—either through an innate sense for what to do or because you’re great at research and assembling ideas. Communication: Special event planners spend lots of time in communication with their clients, as well as with vendors and service providers. Communication in both directions requires patience and different tones. An event planner should have a versatile communication style. One that can translate to high-priced clientele as well as the guy who needs to refill everyone’s coffee. Employers will value event planners who aren’t just great at the logistical aspects of their work, but those who can communicate with everyone in their sphere with clarity, confidence, diplomacy, respect, and a cool head, even in times of stress. Trends and Creativity: A great wedding or special events planner will need to get creative time and again with each client. Each event requires a different sort of creativity. A wedding, for example, will be different from a corporate event, which will be different from a birthday or anniversary or retirement event. That said, any event planner will need to get creative when it comes to spatial arrangement, agendas, and itineraries, and a hundred little details like place cards, style of glasses and flatware, and lighting. If you’re not innately a super creative person with a strong visual aesthetic, you should be comfortable with research. Trends are shared and written about all over social media, in magazines, and at industry events. If you’re someone who benefits from inspiration, and you’re comfortable to gather and assemble information into a cohesive experience, chances are, you’ll be able to excel as an event planner. Budgeting: Every event comes with its own budget. Some are large, some are small, and all are important. Event and wedding planners will be comfortable working within the constraints of whatever budget they’re given. A successful event planner will be able to triage the most important aspects of an event and budget those big ticket items in first. A great event planner will get creative, and find ways to stretch budgets whenever they can to give the client the most for their money. A budget-minded event planner should also be able to tell a client exactly where and how each dollar was spent, without any confusion and without misplacing any funds. Event planners will be responsible for seeing that money from the client goes to the vendors. 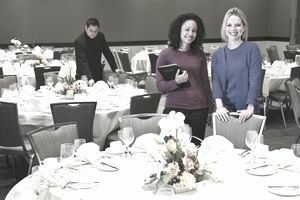 Relationships with vendors will be important to any event planner’s reputation, so making sure people are paid accurately and on time will be essential to an event planner’s success. Organization Skills: Events come with a million little details, from which sort of fruit will garnish cocktail glasses, to the volume of the wireless microphone a speaker might use, to the temperature in the room. That’s to say nothing of expansive events that take up entire hotels and require coordination of travel and hotel rooms. A great wedding coordinator will be able to keep an eye on the big picture—the overall feeling and quality of the event—without losing any of those little details. From experience to budget to timelines, an event planner should be great at organizing the whole package. Event planning can be an exciting, fun, and lucrative career. It’s probably best suited for people who like interacting with other people, and who like work that comes with a variety of responsibilities and requirements. If you think it might be the career for you, look to see if you possess some of the skills listed here. Use the skills mentioned here as you create your resume or cover letter. Seed your resume with these terms to make it easier to find through search. Use these terms as you do your own search for a job. Prepare for any upcoming interviews by coming up with examples of how you’ve demonstrated each of these skills in the workplace, in the past. What Are the Most Important Skills Needed for PR Jobs? What Skills Do I Need to Succeed in Marketing?